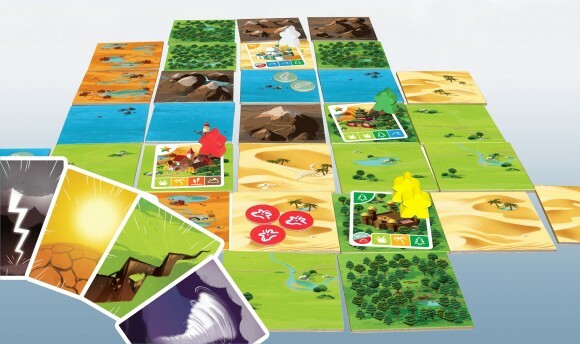 Easy to learn, Gaïa is fast paced game which involves tile placement, area control and influence with a twist of power cards. …and try to satisfy their needs! Use godly powers to shape the world to your benefit. No victory points in this game: you have 5 wooden meeples. Place them all on the board to win! Basic rules allow you to play from 8 y.o. with a simple mechanism and a peaceful game. Advanced rules will give you the opportunity to use godly powers to shape the world after it has been created (with lightnings, volcanoes, rain, sun, earthquakes…). You can even steal the opponent’s cities. Of course, it’s a more aggressive game with a higher level of strategy. Add a Review for "Gaïa"